‘The Nature of Business’ explores how the increasingly unpredictable, interconnected and uncertain nature of business calls for a more emergent, dynamic approach to organisations and leadership. Giles Hutchins, the author, explains through business insights, quotes and examples that a new business paradigm is emerging which challenge prevailing perceptions of business. The prevailing business paradigm of maximization, monoculture and self-interest, he states, is weakening its own resilience and is no longer fit for purpose for the business world we now operate in. Our prevalent business concepts, values, perceptions and practices are being disrupted and systemically challenged; Giles Hutchins argues that they are ripe for a paradigm shift. What is called for is a ‘redesigning for resilience’; a new business paradigm, one that is inspired by nature. The ‘perfect storm’ of social, economic and environmental factors mean organisations have little option other than to adapt and evolve to what Giles refers to as ‘firms of the future’ – businesses more akin to living organisms than mechanistic monoliths designed for the Industrial Era of the past. Life itself operates within an environment of dynamic change and the more we challenge our prevalent assumptions to human nature and nature, the more we are able to bring fresh perspectives to help our organisations adapt and thrive in volatile times. 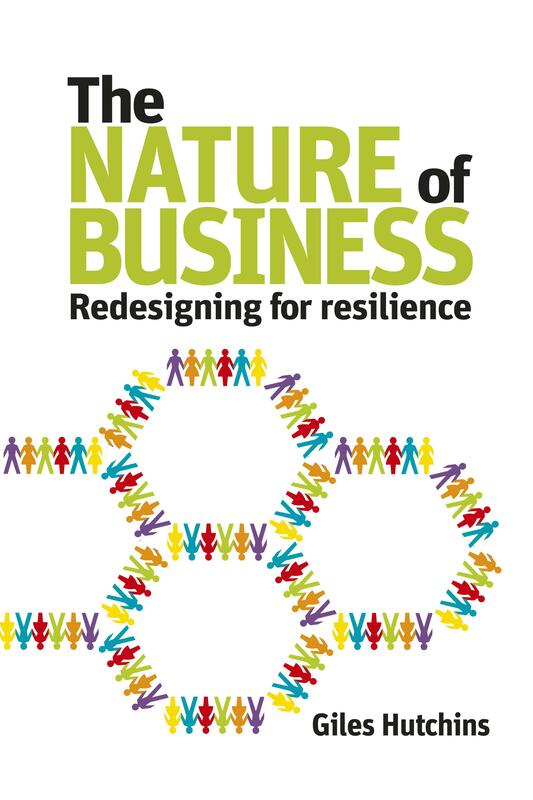 Redesigning for resilience requires us to balance the benefits and simplicities of prevalent mechanistic, reductionist mind-sets and approaches to business with integrated systems-thinking; ecological thinking for business transformation. Business approaches and perspectives quite different from the current ‘take, make, waste’ paradigm are now called for. Industrial ecology, cradle-to-cradle, closed-looping, eco-literacy, natural leadership and biomimicry are at the heart of this business paradigm shift; new ways to deliver improved performance, not just incremental change but systemic change; business systems that work with the grain of nature and in harmony with life. Our understanding of nature has evolved more recently, from viewing nature as a battle ground of competition to one of dynamic non-equilibrium, where an order within chaos prevails due to unwritten natural patterns, feedback loops, behavioural qualities, interdependencies, and collaboration within and throughout ecosystems. A ‘firm of the future’, Hutchins argues, builds resilience, optimises, adapts, integrates systems, navigates by values and supports life-building activities. It is a business inspired by nature. Collaborative, innovative, networking, emergent, dynamic firms of the future are more akin to living organisms hence gain inspiration from how nature builds resilience to thrive within dynamic change. ‘The Nature of Business’ explores how the answers to many of our pressing business challenges lie all around us in nature. Showcasing the pioneers of the new paradigm through examples and case studies, the book presents the tools and techniques required to effect the transformation to a business fit for purpose; fit for the future. The journey towards a firm of the future is as much about individual transformation as it is about organisational transformation, each being interconnected with the other. No man is an island, and no organisation can thrive disconnected. In the same regard, this personal and organisational transformation is about being authentic, and true to your values and value; the authentic self and the authentic organisation go hand in hand. Can business be a force for good, restoring society and the environment, providing solutions that genuinely help rather than hurt? Ought business to be striving for more than just limiting its negative impact? I think we intuitively know it can, it just requires courage to break rank from the current business paradigm of benefiting some at the expense of others. In these challenging (yet pivotal) times for business and humanity, we must realise that to become truly sustainable, human and business life has to become scientifically inspired, emotionally connected and spiritually entwined with nature and Gaia. Nature and business (as with nature and humanity) must be symbiotic and operate in mutualism for there to be anything resembling a suc­cessful outcome. The sooner business realises the opportunities that come with being connected to and inspired by nature, the better for humanity, and for all species. Click here to see the praise that The Nature of Business has gained so far. This entry was posted in Author articles and tagged Biomimicry, Giles Hutchins, Green Books, Nature of Business. Bookmark the permalink.